Fair Warning: Seller "liuguiyun" is a fraud.This seller will give buyers a false tracking number which doesn't have any tracking information. Buyers can report to Amazon. When you are shopping, please make sure buy merchandise from the original seller "Chic-Lover". If you cannot find "Chic-Lover", please click button New under "Other Sellers on Amazon" On Right Side to choose "Chic-Lover". the real security is not deceived. Fair Warning:Due to be easy to be squeezed in transit,clothes are hard to avoid wrinkling. When you find wrinkles in the clothes,please try to iron out them or wash them and dry out. They will be gone.Hope you understand ! Thanks! Features: One piece,High Waist,Solid Color,Back Zipper,Wide Leg. 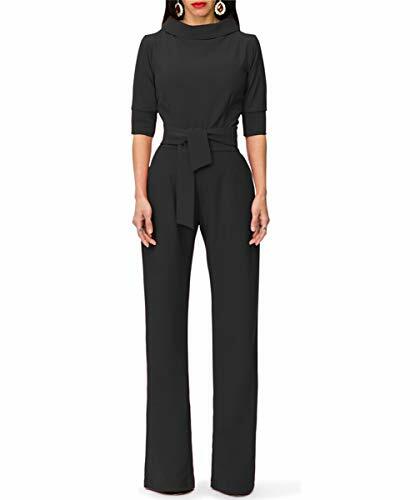 This wide leg jumpsuit is comfortable and suitable for most occasions, showing elegant temperament and eye-catching look. If you have any questions about this product by Chic-Lover, contact us by completing and submitting the form below. If you are looking for a specif part number, please include it with your message.